The fly fishing lodge at Falcon’s Ledge is a unique structure handsomely set in a private six hundred acre canyon, providing a bird’s eye view of the surrounding canyon, stillwaters and wildlife. The 15,000 square foot lodge was designed specifically to provide the ultimate lodging experience for secluded fly fishing and pheasant hunting adventures. 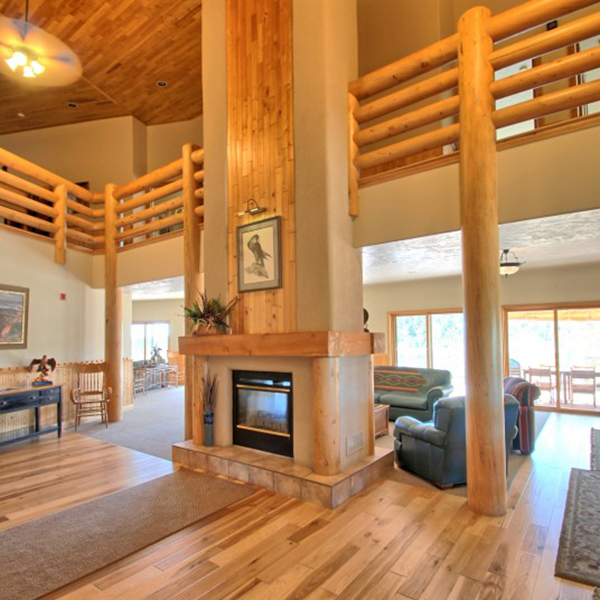 Watch a virtual tour of the lodge. From the moment you pass through the front gate you will know you have come to someplace very special.The lodge at Falcon’s Ledge provides elegant amenities and service while letting you relax as if you were in your own home. While you will be pampered by our staff, you still have the freedom of helping yourself to a soft drink or snack in the kitchen. We want you to relax and make yourself at home. With plenty of luxurious room to relax, you can read a book, play a game of chess, shoot pool in the game room, watch the deer, or enjoy the hummingbirds feeding on the deck. On a limited basis throughout the year we offer Bed & Breakfast accommodation for our guests to enjoy the comfortable elegance of the lodge at Falcon’s Ledge. Our Utah bed and breakfast guests enjoy all the amenities of the lodge. Arrive after noon and hike in the canyon or relax in the sun on our expansive deck overlooking Stillwater canyon. Choose from a single queen room with jetted tub to a double queen bunk room that will sleep six adults. Let us know the number in your party and we will be able to arrange the best room for you. Children twelve and older are welcome. And of course breakfast is included. For executives, celebrities or families who want absolute privacy and security, the entire canyon and lodge may be reserved by the week. We will provide as much or as little staff as you need.